VTA reached significant milestones for bringing BART all the way to downtown San Jose and into Santa Clara with a $730-million shot in the arm from California’s Senate Bill 1, the newly passed gas tax. Announced this afternoon in Sacramento, the California State Transportation Agency funding helps pave the way to a $1.5 billion request for federal funding to be made this summer. “The magnitude of today’s announcement cannot be understated, nor can the regional significance of this project,” said VTA General Manager and CEO, Nuria Fernandez, during the press conference held at the State Capitol. Fernandez thanked State Senator Jim Beall, chair of the State transportation and Housing Committee, for his leadership in helping to transform mobility in the San Francisco Bay Area. 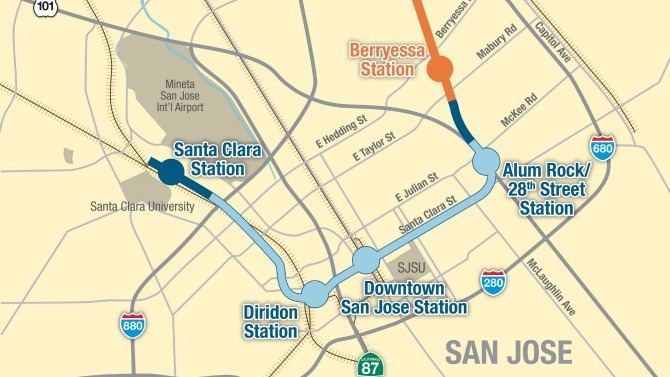 In addition to the state funding, BART’s Board of Directors moved the Silicon Valley Extension project forward by approving a single-bore tunneling methodology for the 5-mile subway through downtown San Jose, and the two station options including Downtown San Jose West (between Market and Fourth Streets in downtown San Jose) and Diridon Station North (adjacent to the south side of West Santa Clara Street, between Autumn Street and the San Jose Diridon Caltrain Station.) This vote was the last step before a federal funding request can happen.